The coseismic Coulomb stress change caused by fault interaction and its influences on the triggering and delaying of earthquake are briefly discussed. The Xianshuihe fault belt consists of Luhuo, Daofu, Kangding, Qianning and Ganzi fault. Luohuo (M S=7.6, 1973)-Kangding (M S=6.2, 1975)-Daofu (M S=6.9, 1981)-Ganzi (M S=6.0, 1982) earthquake is a seismic sequence continuous on the time axis with magnitude greater than 6.0. They occurred on the Luhuo, Kangding, Daofu and Ganzi fault, respectively. The coseismic Coulomb stress changes caused by each earthquake on its surrounding major faults and microcracks are calculated, and their effects on the triggering and delaying of the next earthquake and aftershocks are analyzed. It is shown that each earthquake of the sequence occurred on the fault segment with coseismic Coulomb stress increases caused by its predecessors, and most aftershocks are distributed along the microcracks with relatively larger coseismic Coulomb stress increases resulted from the main shock. With the fault interaction considered, the seismic potential of each segment along Xianshuihe fault belt is reassessed, and contrasted with those predicted results ignoring coseismic Coulomb stress change, the significance of fault interaction and its effect on triggering and delaying of earthquake are emphasized. 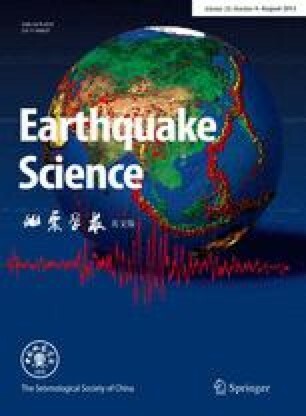 It is concluded that fault interaction plays a very important role on seismic potential of Xianshuihe fault belt, and the maximal change of future earthquake probability on fault segment is up to 30.5%. Foundation item: State Natural Science Foundation of China (No49834002), United foundation of Seismological Science (No100061) and Key Project of China Seismological Bureau (No95041007).